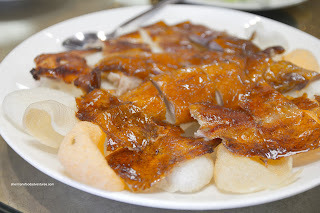 So yes, we did start with the 2 courses of Peking Duck (after the daily soup). It arrived glistening with a beautiful colour, crispy texture and nicely rendered fat. There was also a fair amount of moist meat attached to many of the slices. The only thing that brought this dish down was the doughy and thick crepes. The second course was the Duck Lettuce Wrap. 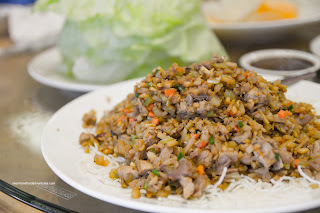 There was no absence of duck meat in the stir-fried filling. The root veggies were still crunchy while the entire dish was neither greasy nor salty. The lettuce cups were extremely large which was good and bad. Lots of lettuce to do the wrapping with, but kinda sloppy at the same time. The drum roll please... for one of their signature dishes - the Live Crab in House Special Sauce (aka curry crab). 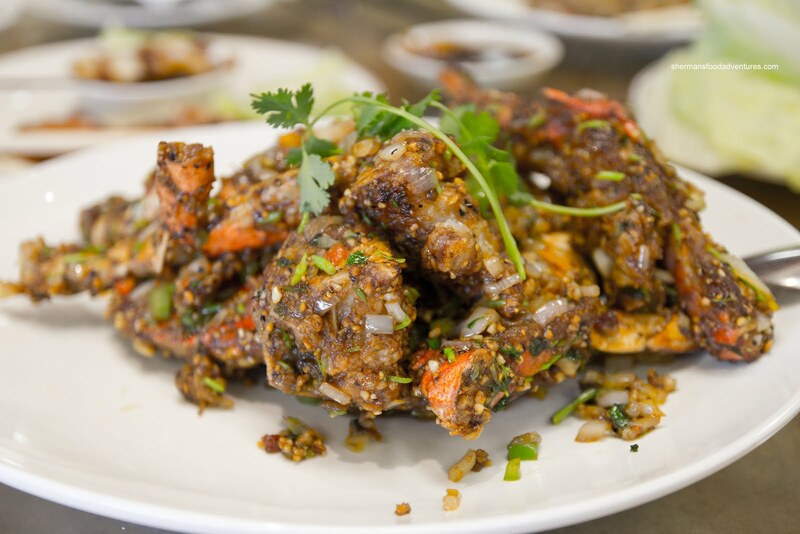 Normally, it is not a great idea to overwhelm the delicate texture and flavours of crab with too much seasoning and spice. However, in this case, the crab was able to stand up to the various ingredients. As for those ingredients from what I could gather, there was garlic, green onions, dried shrimp, curry, shallots, cilantro, black pepper, chili oil, sugar (most likely palm), soy and black vinegar (I could be wrong on a few). It was a good combination of sweet, salty, tart and spicy. For a set menu, the crab was pretty large and meaty. Another house specialty is their Famous Soy Chicken, which we ordered as an addition to our set menu. The half-chicken was quite meaty where it was sufficiently moist throughout. 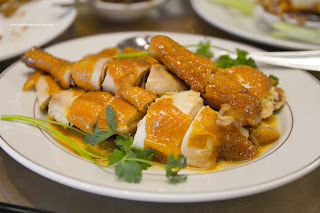 The soy cooking liquid penetrated the skin into the meat resulting in a flavourful chicken. However, the skin itself was pretty salty since it took the brunt of the flavours. Moving along to yet another specialty was the Soft Spareribs in Chef's Special BBQ Sauce. Considering that the ribs had plenty of cartilage and were mostly end pieces, they did a good job in braising it. It was moist and tender practically falling apart. 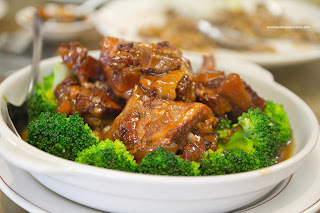 The tendon and cartilage portions were pretty much like jelly and were super easy to eat. Flavourwise, it was quite sweet and could've benefited from more balance. The one dish we didn't really care for was the Beef with Fresh Mango & Asparagus. 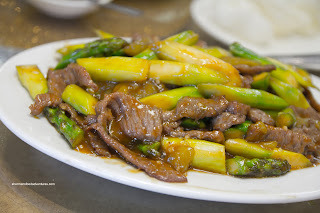 The good parts of the dish were the beef, which was tender with a slight chew, and the nicely cooked asparagus. The mango, on the other hand, was reduced to a mush and unappealing. The whole dish was too saucy and sweet. It was starch-thickened, but then it was merely a sweet goopy mess. We wanted to li ke it, yet it just lacked balance. 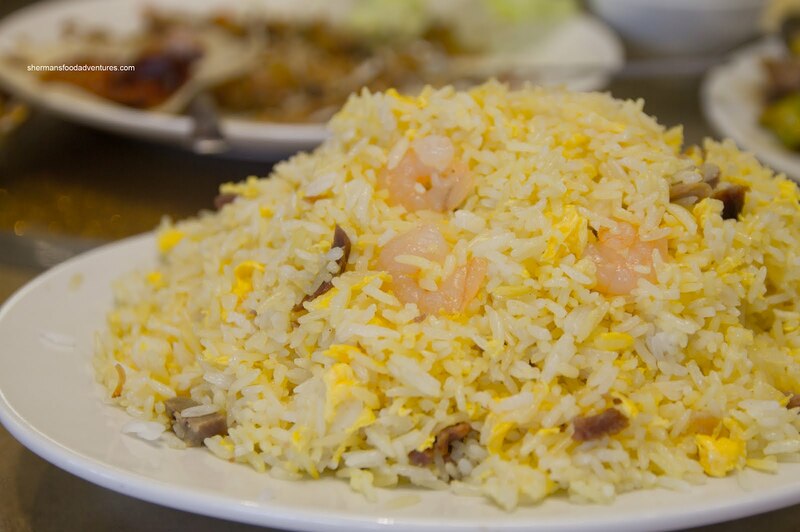 Our last dish was the House Special Fried Rice. There was a lack of colour because we chose to omit the green onions. The rice was pretty dry, which afforded a nuttiness. It was neither greasy nor salty. There was only a modest amount of BBQ pork and shrimp which made the rice pretty plain to eat. It could've benefited from more ingredients and salt. Overall, we were satisfied with our meal, yet we definitely had our favourites and n ot-so-favourites. 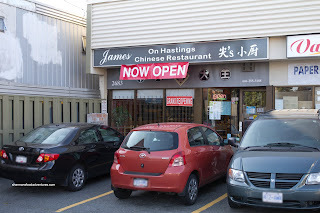 The Peking duck was surprisingly good (except for the crepes) and of course their signature crab rocked. However, everything else was pretty standard. It's not like we didn't like the chicken or the ribs, they were good. Just not "wow". And honestly, there are not many "wow" things in general anyways. 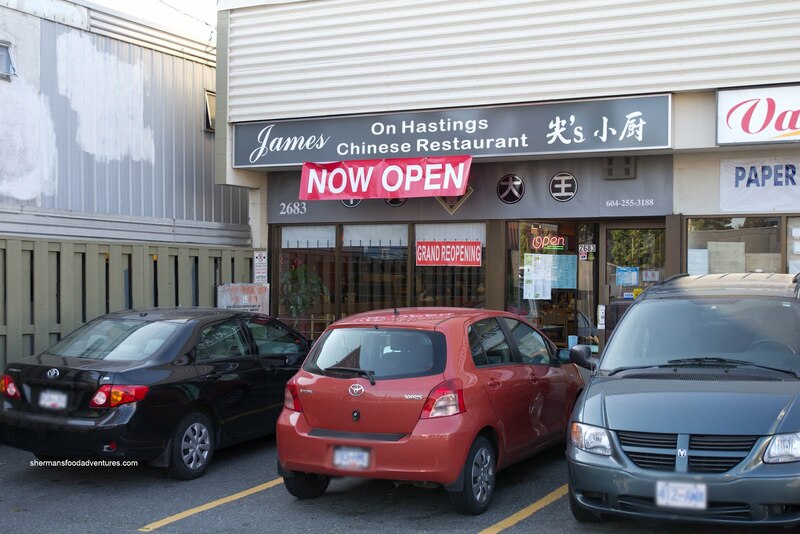 If you pick the right dishes, James on Hastings is a solid choice for Chinese eats. 1) Pricewise, is it still the same compared to Luda or it is more "balanced" now (ha!). Your comment about $$$ is the same as back when it was Luda. @KimHo I think the prices are about the same. Yah, they did do a relatively good job with dinner. I would go back. The curry crab is one of the best chinese crab dishes I've ever tasted. LOL! I think we both felt the same way about the beef with mango and asparagus. It was just a bit...well, strange somehow. Anyway, regardless of that, I loved my meal there! Plus it's open late. Handy after volleyball! @Victoria Yup, been there for late night and it was good!